I had a few requests for the Avocado Salsa recipe pictured in my Smothered Chile Colorado Burrito picture, so here it is! My grandparents live in California and are EXTREMELY lucky (in my opinion) because the have an avocado tree in their back yard. I LOVE avocados… seriously, I could eat them for every meal and find a new use for them! How awesome would it be to have these just growing in your backyard to use at your convenience?! I would be in heaven! This salsa is SO easy to whip up and tastes absolutely AMAZING! It is great with chips dipped in it or topped on your favorite Mexican dish.. or basically anything else you would want to put it on! It is my absolute favorite Mexican food topping and I just know you will love it too! This is the perfect topping, or dip, to any mexican food! It is absolutely delicious! Yumm! Thanks for posting this. I would love some on my omlette this morning! Exactly how I like my salsa... thick, chunky, with tons of avocado. I could eat this with a spoon, honestly!! I made your burritos yesterday and they were a huge hit. My husband and I LOVED them. I absolutely love your website and recipes. Keep them coming!! yes, yes, yes! A thousand times yes!! avocado salsa? haha that's super cute, but this is guacamole, no? unless you think guacamole is that avocado puree bs that grocery stores and taqueria's try to pass off as guacamole. :) it's yummy, this is how I make mine. i eat with a spoon forreal. I think the difference is, with real guac, the avocados are mashed up w/ the other ingredients & there aren't any tomatoes. This is definitely more of a salsa w/ the tomatoes & the chunky avocados! Whatever you call it, though, it's good!! Just perfect! Not too much of any 1 thing, a perfect balance of flavors. Even my 2 year old ate some - and asked for more! Mouth-watering, creamy goodness, this is! Packed with healthy fats, too. Can't wait to try it. It looks delicious, but I think it needs some heat added to it! This looks delicious :) I was looking for some sort of avocado based side dish to serve with a mexican meal later this week! This is perfect. I love your blog. This is exactly how I make my guacamole. But I add a jalapeno and everyone raves about it whenever I make it for parties! OH YUM! I could pretty much live on this, so so good! Sounds like guacamole to me...? I love this recipe & I’ve featured it in my Cinco de Mayo Recipes Roundup over on my blog, Anyonita Nibbles. I’ve also joined your sites & started following you socially! You can find the roundup here: http://anyonitanibbles.blogspot.co.uk/2013/05/cinco-de-mayo-recipe-roundup.html I hope you’ll stop by & share the roundup with your followers! :) Happy Cinco de Mayo! I have made this multiple times and my hubby and I devour it! Thanks for the great recipe! This looks so good! Thinking of making it for a summer block party. How much does this yield? Should Idouble it or triple it in order to feed all the neighbors? This looks fantastic, I will make it as soon as my avacadoes are soft. Looks yummy! I live in California also ( San Diego) and we are blessed to have an avocado orchard in our backyard with about 20 trees. We're always looking for new recipes to use up avocados. I will have to try this one for sure once they start producing. have you tried omitting the tomatoes and adding apple? Its even better!! Very nice! I miss California because of avocadoes and citrus fruits!!! Fab recipe! Looks so yummie, Will make a great summer snack for the family. Making this tomorrow . Try that with Jicama and white corn partly cooked. It gives extra crunch to it. Looks great, but I really wouldn't call this a Salsa since it has no HEAT. It's more long the lines of a Avocado dip. I'll make it but I'll be adding 1 to 2 Serrano Chiles seeded and minced. That would be very YUMMY too. I could eat this stuff rolled up in a tortilla, with some shredded chicken, lettuce, and cheese. This was excellent! I did add in a few shakes of tobasco sauce, to give it a little spice and a little more garlic salt, but it was a huge hit!!! 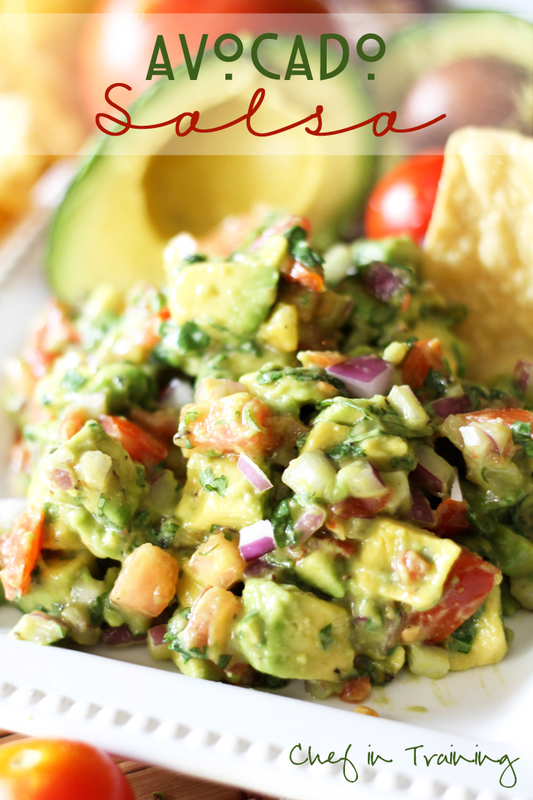 This avocado salsa sounds so delicious and I for sure will be making it. I love avocadoes and I know everyone in my family will love it, too. Thanks for sharing. Looks delish, can this be made the day before and kept in the fridge? Her recipes sound delish. I will have to try for my mobil home park crew here. I'm a cook and looking for new exciting receipes. Thanks. I will keep looking on your page.